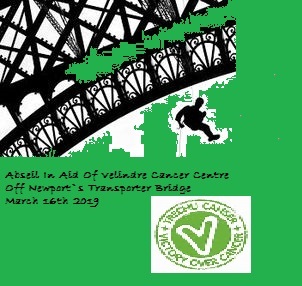 Abseil in Aid of Velindre Cancer Centre Off Newport`s Transporter Bridge. Weight Limit 21Stone; Although there is a maximum weight for this event, the most important factor is waist and body size. This is to ensure that the abseiling harnesses fit correctly and safely. *THIS IS A NON REFUNDABLE EVENT.